So you are out on your walk, enjoying the sights and sounds when Fido sees another dog out for its walk. All of a sudden Fido is barking, lunging and going crazy at the other end of the lead. You’re lucky you haven’t been pulled over, and you are almost as frantically trying to gain Fido’s attention. Fido’s ears are turned off, he’s spitting out or not even taking the dried liver you’ve brought, and he isn’t responding to you in any way. You either drag him away, or the owner of the other dog turns and walks away as for all the world, it looks like Fido is an aggressive dog and they are worried for their own safety. A thing to remember - most aggression is based in fear. There are reasons for this behaviour, and they can be influenced by 3 things. Genetic makeup of your dog – dogs have been selectively bred by humans to have certain attributes, temperaments and looks. Dogs that are bred for guarding, hunting, herding or working can be more compulsive than those bred for companionship. What does your dog look like – some dogs for examples Shar Pei’s and Pug’s have facial features which are hard for other dogs to read – this in turn can lead to reactivity. Previous experience – your dog has learned many things previously – this can include if I bark like this the scary dog goes away, or when I see another dog coming my owner starts yanking on my neck and causes me pain – so now I want to scare the dog away sooner rather than later. The current situation – think about it – is it dark, has the dog been frightened by the garbage truck already, is he sore...? Punishing your dog for barking, growling or lunging at something they are fearful of will not alleviate their stress – it can in fact make it worse! Please do not follow the techniques of a well know dog trainer on TV that involve checking, “touching” or kicking a dog in its flanks. ​These techniques may only serve to increase the problem, as now your dog will be scared of you and the other dogs. Why is your dog acting this way? Your dog may be scared of what is approaching – barking at it, makes it go away. 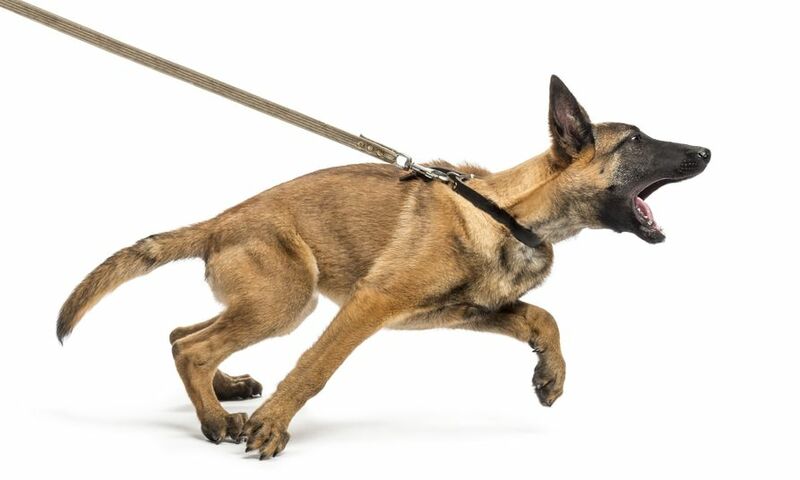 Your dog has found from previous experience, that when another dog approaches, his leash tenses, his owner tugs on his lead with his collar, his owner gets mad and yells at him, or might hit, or kick him, or even worse “alpha roll” him. The dog is just trying to warn the dog to go away so that he doesn’t have to get in trouble. So when could your dog have had a bad experience? Do you or did you go to dog parks? Unfortunately, some dogs get bullied in dog parks (I hate the places). This is usually the result of inattentive owners that aren’t watching, or when they are, they don’t care and rely on the dog to ‘sort it out’. Your dog has been on a walk, another dog has approached and you have pulled on the lead, tightened the collar or yelled at your dog when he has tried to interact with the other dog. He may have been trying to be friendly, and you may have had his best interests at heart. An off lead dog has rushed your dog and scared him. Your dog, may have attempted to play with another dog – the other dog has leash reactivity and has snapped back (similar to what your dog is doing now). It can be just the 1 bad experience for your dog that sets up the domino effect of leash reactivity. This is what you or your dog will do when faced with a stressful situation. Imagine a robber has tried to mug you as you get off the train – do you fight back or run away? Often dogs with leash reactivity are actually ok with meeting dogs when they are off lead. Why do you think that is? The lead is a restraint, and it means that your dog is unable to get away should it feel it needs to so. The only option left is to fight. So what can you do to help, and can this behavior be fixed? The answer is yes this problem can be fixed. However, this isn’t something that will go away overnight, or even over a week or two. This is a problem that you will need to continue to work on and manage. The approach to this is using science and learning theory. The big words are classical counterconditiong and systematic desensitization. By doing this we are working on the emotional side of the behaviour. We are aiming to convince the dog that the scary thing is actually a good thing, a very good thing. This is a gradual approach and involves many (very many) pairings of scary thing and very good things. For this to work, scary things must always be the CAUSE for very good things. What do you need to do for this to work? When your dog sees another dog, you need to remain calm and relaxed. Seriously, don’t forget to breathe! I am an owner of a reactive dog, and trust me, breathing is helpful. Don’t tighten your dog’s lead or yank – try and keep the lead loose. You need to find the critical distance – this is the distance at which your dog reacts. It may be a few meters, it may be a football field. When you begin training, you will start at a distance greater than the critical distance. Find your dog’s absolute favourite reward – for most dogs this is food – usually BBQ chicken, for others it may include toys such as tuggies, balls or Frisbees. Use these rewards only when you are training this exercise – this adds even greater value to them. Get the right equipment – is your leash too long, or too short? Is it comfortable and easy for you to hold? Avoid retractable leashes – they do not allow your dog to feel a loose lead, and they do not give you any control over your dog. Many dogs and people have suffered serious injuries as a results of retractable leads. Does your dog’s collar or harness fit securely? Are they comfortable for the dog? A collar that causes your dog pain, will only make the problem worse. Do not use prong collars (they are illegal anyhow) or check chains. You may even want to consider the purchase of a front attach harness – I like the Black Dog Balance Harness (also get the halter connector clip – so you can attach the collar to the harness for extra security) and the Freedom harness. Both of these harnesses offer front and rear attachment points – this can also be used with a double ended lead. For super strong dogs, you may wish to consider the use of two separate leads or a double ended leash on two separate attachment points – this provides that little extra security. For some dogs, you may need to consider using a head collar – an example of this is a gentle leader or Halti – I prefer the head collars that attach to the lead under the chin. If you are using these, ensure your dog has been acclimatized to it slowly and that it is fitted comfortably. Pair with a double ended lead and harness – that way if your dog lunges, you can use the harness as a brake and not your dog’s neck. How it works: Remember, the scary thing must be the CAUSE of the very good thing. Take your dog out, set him up at a distance greater than the critical distance (with each session you will be aiming to decrease the distance required). Bring another dog (a friend’s dog) or wait at the distance required on a bike path for a dog to walk by. As soon as your dog has noticed the other dog start feeding a steady stream of small tasty treats, or playing a game of Tug. You can feed from the ground and add a “find it” cue, this in turn changes your dog’s body language from an assertive stance, to a more relaxed stance. Whilst you do this, watch your dog very closely – if they are showing signs of distress, remove them further from the situation. Learn to read and understand canine body language. Stop your treat delivery as soon as the other dog has disappeared from sight. If your dog barks at the scary thing during this training, continue to deliver the very good thing however move further away as quickly as you can (which will probably be slow as you continue to feed your dog small tasty pieces of chicken). Repeat this small training session regularly – as long as your dog is comfortable, start at the distance you reached in the previous training session and aim to decrease the distance further each time. Faster moving scary things, louder scary things, more intense scary things will require greater distance and even more very good things. You should also teach a Find It cue, an Emergency U-Turn or "Let's go" and a Leave it cue. A solid recall in the event that you dropped your lead etc, is also recommended. ​Please also review the Look At That game. If you are having problems, please enlist the help of a positive reinforcement trainer. McConnell, P. and London, K., 2009. Feisty Fido. 1st ed. Black Earth, WI: McConnell Publishing.